Join me for another month of favorites, and take a look at what’s on my wishlist! Hey everyone! How has school been going? Has it been going really slow or flying by for you guys? I’m excited to be back here at school, but that means more pimples, stress, and under eye bags. Eeeeeeek! I know. It’s quite tragic that I have zero eyebrows. Well, I actually do have brows, but my hair is so blonde that no one can see them when I’m bare faced. I tried a couple things to make my eyebrows pop, but nothing worked until trying the Brow Wiz from Anastasia. For a while, I went to Beauty Brands to get my eyebrows waxed and tinted, but there were a couple downsides to that. First, it only lasted three weeks. Second, I would walk out of Beauty Brands every three weeks with $35 less in my bank account. And third, my small town doesn’t have a Beauty Brands, so I would have to go home, which is two hours away. Talk about not worth it. Next, I tried using the Anastasia brow powder. And while that worked at the time, it is nothing compared to this pencil. The powder would come off very easily, and not fill in everything completely. There would be little gaps in my brows! 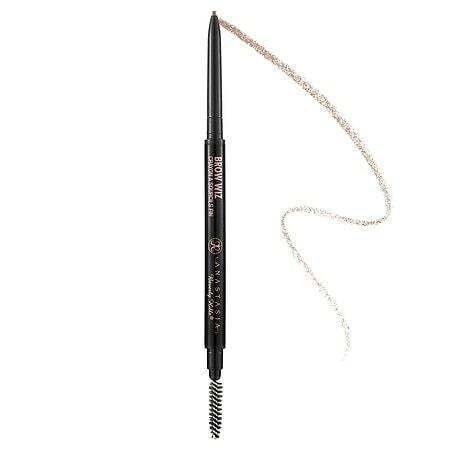 Needless to say, my brows were not on “fleek” until I bought this little number. It’s smudge proof, fills in all those little gaps (from over plucking), and gives you a natural look. Definitely recommend this product. I purchased a wax melt similar to this one at Wal-Mart just before school started. I like it more compared to the standard candle. The scent with a wax melt goes further throughout the room much more quickly than a candle would. I live in a fairly big house with my roommates, and the scent even runs down the hallway and stairs from my room. Also, I don’t have to use a lighter, which is a plus. Fire scares me. I am not the one you see lighting fireworks, or in this case, candles. If you thought you spend a lot of your time on apps like Pintrest and Tumblr, then that will seem like nothing after you download and obsess over Popkey. We’re in the age of GIFs (soundless video clips, for the unaware). This app is perfect for those of you who use GIFs as a way to share your feelings. After all, what better way to show you’re excited than to use a GIF of Buddy in the movie Elf jumping around? And what better way to show you’re annoyed than to use a GIF of Nicki Minaj rolling her eyes? The possibilities are truly endless. This app is a giant GIF library. You can look through different categories of GIFs, or type keywords in the search bar. When you find a GIF you like, all you have to do is copy and paste where you would like the GIF to go. Personally, I use them mostly in my messages. And you can even download a GIF keyboard to save your favorite ones. Game of Thrones brings out my inner nerd. For the past year, all I’ve been hearing about is GoT. So, naturally, I decided to give it a try. And I’m hooked. I’m only halfway through season one right now, but enjoying every minute of it! At first, it’s a little confusing with all of the different family names and kingdoms, but once I got the hang of it, I didn’t want to stop watching. There’s a lot of history to the show, so this is definitely one of those shows you can’t do homework and simultaneously watch. In short, Game of Thrones is about two powerful families going head-to-head in order to overtake the whole kingdom. While the show follows these two families closely, it also follows the other families who are trying to regain their independence. If you like sci-fi, fantasy, magic, dragons, and good-looking guys, then this show is for you. If you haven’t already, you need to start watching! Cazzette is fairly new to the music scene. The duo of Alexander Bjorklund and Sebastian Furrer coined the term ‘dubhouse’ with their upbeat, light, and energetic music. If you want a tune to get ready or to pump you up, then take a listen to this. I’m constantly playing it on repeat! I’ve tried to pinpoint my style so many times, but it’s so hard to do. I consider my style eclectic—a little bit of everything. I like to be on the lookout each season for new pieces to build my wardrobe, and this fall, I really want a black leather skirt. Now, I’m usually not a skirt girl, but the outfits I’ve seen created with one are so cute! And I feel as though this piece can be brought into other seasons as well; in the winter with tights or in the summer for a concert. Because what better way to get into the fall spirit than with cozy sweaters and big scarves? I like this one from Effin Shop (absolute fave online store for everything). The plaid scarf is to winter and fall as floppy hats are to summer. I love plaid scarves because most of them have many colors and a neutral tone, so they can be matched with virtually anything. In other words, I need this. I’m a huge fan of making my lips pop as a part of my makeup routine. You’ll see me wearing bright reds and hot pinks more often than not! But as of right now, my makeup bag is only filled with summer colors. A plum lipstick looks great on everyone and brings out the face’s natural ‘flushed’ look. 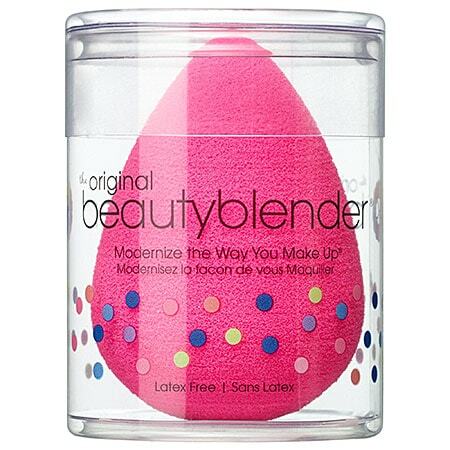 I’ve heard so many great things about the beautyblender. Since I use liquid foundation, I think this would be such a good investment. I have a foundation brush right now, but it often leaves my foundation all streaky. So then I have to spend extra time trying to fix all of the streaks. We’ve all been there, and know that it’s not a fun time. What do you love this month, and what do you want for next month? Anything you want to buy for the fall season? Anything you recommend? Let us know in the comments below!